What "child" hasn't dreamed of having super powers and saving the world? 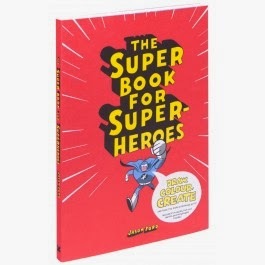 The Super Book For Super Heroes allows children of all ages to create the own super hero universe by providing endless hours of creative activities aimed at drawing the ultimate super hero and villain with gadgets a plenty. Readers can create a Secret Code Wheel and learn to send secret messages on their way to becoming an expert on all super powers. Just the right combination to create their own super hero and giving that hero just what he needs to save the world. With easy to follow instructions, the reader can create super heroes in all shapes and sizes. It would be wise to watch out for the villains as they are out in force as well. The best super heroes are nothing without a nasty villain to conquer. What type of villain will you create? One that can be easily conquered or one who nearly destroys the world before your super hero uses every last drop of energy and power to eke out victory? Only time and your imagination will tell. It doesn't take a child good at art to enjoy the Super Book for Superheroes. Ready to assemble masks and an array of super hero stickers give a jump start to those who might feel timid about drawing. Step by step illustrations slowly build confidence in their own creative endeavors. A great activity book to pull a child away from the T.V. and video games. Just be sure to keep the refrigerator clear and have plenty of magnets handy for all of the cool displays that will appear proudly on its doors. One of my lucky readers will win a copy of The Super Book for Super Heroes by Jason Ford. Use the Rafflecopter form to enter. By entering, you acknowledge you have read the terms on the form and agree to them.Contest ends 12/9/2013 at 11:59 EST. I liked The Modern Magazine: Visual Journalism in the Digital Era By Jeremy Leslie. I thought that it sounded interesting. Thanks. By Martin Salisbury and Morag Styles.